One of the keys to getting good wildlife photos around the house is of course having wildlife around the house. With even small yards able to attract wildlife (especially birds), the next key is having a camera with a good wildlife lens mounted and ready for immediate use when the wildlife shows up. The incredible combination of the 1D X Mark II and EF 200-400mm f/4L IS lens has been taking on this duty for me recently. I have had a very high number of black bear sightings this spring (most frequently after the sun sets), and the range of focal lengths this lens has, including up to 560mm with the built-in extender, along with the f/4 aperture has been valuable. On this rainy Wednesday, it was an ovenbird that made my day. This bird is typically found deep in the forest. While they tend to be low to the ground, the light levels there are dismal. On this day, heavy cloud cover provided reasonably bright and very soft lighting at the edge of the forest where this bird happened to be. The wet conditions provided a saturation boost and some tiny water droplets on the bird. The situation was ideal. I quickly grabbed the camera and lens combo, threw the switch to place the extender in the optical path and went into action. I worked into a position that gave me an attractive background with a clear view of the bird, initially a profile. While I captured some ideal profile images, the bird began hopping into different positions and in this one, the tail wind ruffled its feathers. I'm still undecided between which of the two poses I like best, but decided to share this one as it appears more lively. 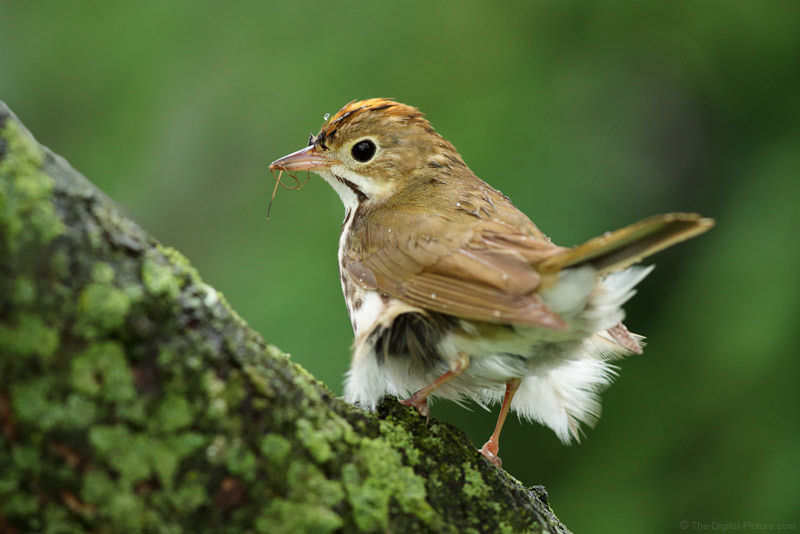 What is in the ovenbird's mouth? Good question. One item is an insect leg, perhaps from a grasshopper. The other is unknown, but perhaps a piece of moss or similar. On this day, having a camera and lens ready to use for wildlife gave me a nice set of photos out of a very brief encounter with circumstances aligning nicely. The entire session only took a few minutes out of my day. Be ready and when opportunities arise, make the effort to go after them.